Click on the links below to access the materials. Photo Supplement to "A Spectacular Balancing Act"
"Annotating Vegas: Mapping Performance Interventions at ATHE 2017"
"Four Principles about Site-Specific Theatre: a Conversation on Architecture, Bodies, and Presence"
In “How to Win Intro to Theatre” Stephen A. Schrum shares his experiments with motivating student learning by making his theatre course into a game. He contends that educators can capitalize on millennials’ familiarity with video games, in which they reach various levels of achievement, to help learners feel a greater sense of engagement and satisfaction with their coursework. Ed Menta approaches student engagement in a more personal way in “I Finally Saw the Greek Theatres: Impressions on Teaching Undergraduate Theatre History.” In this Note, Menta shares his deeper connection to Greek Theatre after visiting the historic physical sites. Read the full print issue on Project MUSE here. Read full issue on Project MUSE. I often speak to students about awakening the dead spectres of theatre history. This idea derives from, but also engenders my own passion for research in theatre archives. Should we call ghosts to life? What good can come of theatre students learning to awaken the dead? And can the digital natives of today materialize phantoms in new ways? 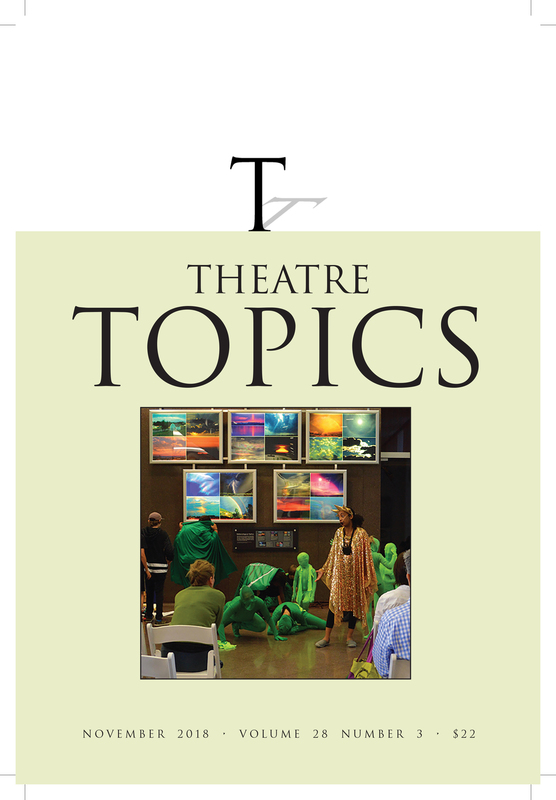 This essay aims to answer these questions by examining changing research practices in light of the challenges presented by digital archives of theatre and performance material. In the digital age, it may be that archival-based courses drawing on digital tools provide an exemplary space to allow students to engage with theatre history. Yet, the simplicity of hyperlinks, their ability to provide direct and rapid access to information, conceals the intricate work required to forge these connections. While attempting to write a love letter in middle school I discovered the limits of language, or at least of nouns, love being at the top of the list of the deeply problematic and highly reductive. All the feelings, the energetic messiness, the profoundness of my unique angst could not be scooped into letters. Perhaps my frustration with language led me to the continual staging of the ephemeral, the immersive experience of engagement. While devised work extends beyond a four-letter word, I resent the reductive limits only slightly less than my fifth-grade self; and yet, for a process to extend beyond the temporal, we are left to our clumsy linguistics. Chicago currently delights me in Wittgenstein’s language game of pointing to the thing in the attempt to create shared definition, as numerous performance companies actively wrestle with the process of making work.